From off the beaten path winter activities to charming cities and towns like Lewiston and Bar Harbor, there’s no shortage of things to do in Maine. Mountainside hikes through a kaleidoscope of fiery fall colors. Savory sea-to-table dinners in Portland. Cross-country glides through snow-covered pine. All waiting for you. Whether you’re looking for a summer family vacation or winter weekend getaway, these authentic experiences will leave you feeling inspired. Make some room on your bucket list. These experiences make memories that last a lifetime. Whether it’s natural splendor, handmade crafts, or unique cuisine, cities in Maine offer surprise after surprise. Summer waves give way to fall colors, and winter runs turn into spring trails. In Maine, each season offers its wonders. 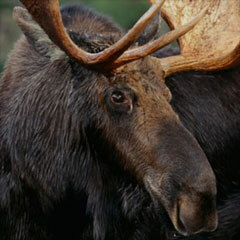 Maine’s majestic mountains, deep woods and rocky coasts are home to awe-inspiring wildlife. You can sometimes spot whales right from the coast, but a whale watching cruise will give you a close-up view of humpback whales, pilot whales, minke whales, finback whales and more. Birdwatchers will find themselves in a state of bliss, especially if they’re hoping for a glimpse of puffins. Maine’s ocean islands make the perfect nesting sites for the orange-billed beauties, and Seal Island and Matinicus Rock at the mouth of Penobscot Bay are reliable viewing areas. To catch a glimpse of the king of the Maine woods, book a moose watching tour (or moose safari) from mid-May through July or in the fall. Looking for a little perspective? Start by climbing the spiral staircases of a few of Maine’s 60 historic lighthouses. 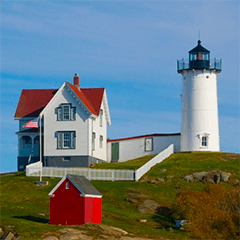 Whether you decide to make the rounds by car or by boat, plan on checking out a few icons like the Cape Neddick lighthouse in York, the Portland Head Light in Cape Elizabeth, and the West Quoddy Head Light in Lubec—the only red-and-white striped lighthouse in the country. 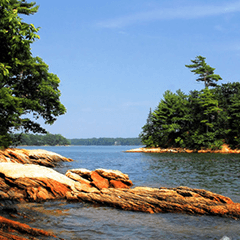 Then be sure to cruise along one of Maine’s four National Scenic Byways. Acadia All-American Road—the only to be designated as an All-American Road—winds through Mt. Desert Island and Bar Harbor. 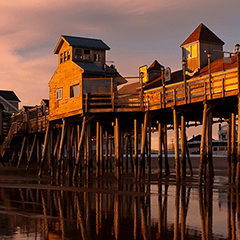 Whether you want to catch some rays on Maine’s beautiful beaches or catch some thrills on a seaside roller coaster, family fun is never far away. 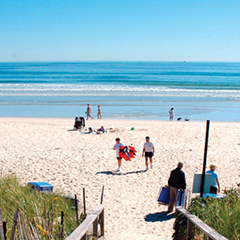 From Kittery to Old Orchard Beach, Maine’s sandy beaches make the perfect summertime playground for the whole family. For a wild (and nostalgic) ride, head to Funtown Splashtown USA in Saco where you’ll find the state’s only wooden rollercoaster. And what better way to cap off a day of family fun than with a drive-in movie under the night sky? Hoist the sales. Grab a paddle. Hop on the ferry. Whether you take to the seas or make a splash whitewater rafting, these are adventures you won’t forget. 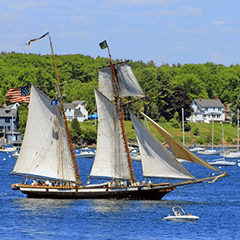 And we can’t think of a better way to get acquainted with Maine’s epic maritime history than with a windjammer cruise. 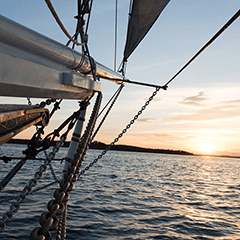 You can work the sails, lift the anchor, and even steer these old-school sailing vessels. Inland, you’ll have no problem finding a lake for a refreshing dip or to cast a line. 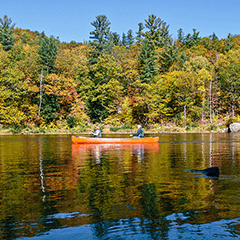 Maine’s more than 30,000 miles of rivers and streams mean you’re in for some excellent fishing and thrilling rafting. 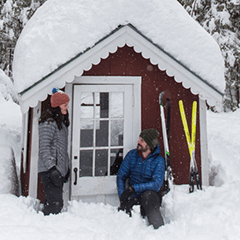 If frozen lakes, snowy slopes and endless trails sound like your kind of playground, then winter in Maine is for you. Try your luck at a little ice fishing, or bundle up for a day of adventure as you explore Maine’s thousands of miles of connected snowmobile trails. 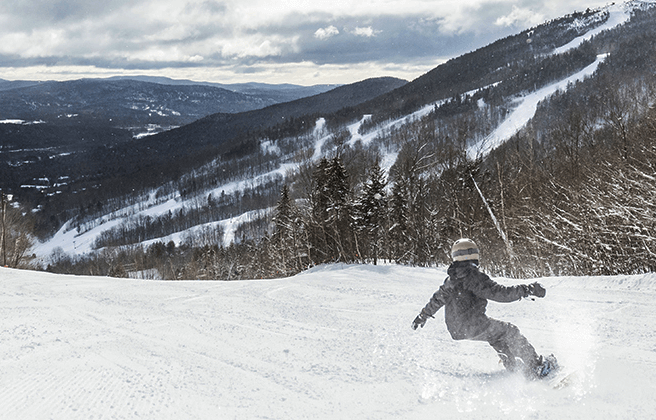 Quieter trails await when you opt for cross-country skis or snowshoes, but if you’re looking to make some downhill turns, Sunday River and Sugarloaf are just a couple of many ski resorts that offer plenty of adrenaline pumping runs. Home to a dazzling national park and 32 state parks, Maine’s wild vistas will nudge you to lace up your hiking boots or set up camp. First stop, Acadia National Park. With jaw-dropping views of the Atlantic from Cadillac Mountain, winding carriage roads, and serene forests, it’s no wonder millions of people pay a visit to the park every year. 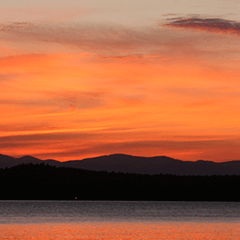 But don’t be surprised if you find equally stunning landscapes at any of Maine’s 32 state parks or natural attractions, like Katahdin Woods & Waters National Monument. 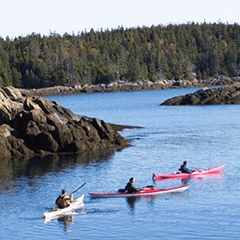 Maine’s breathtaking natural beauty isn’t the only thing that will leave you feeling inspired. Our arts and culture are thriving. No matter which part of the state you find yourself in, you’re sure to be close to one of Maine’s many music festivals. 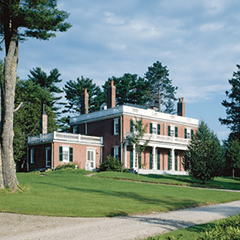 If it’s art museums you’re after, the nine museums along the Maine Art Museum Trail will give you plenty to ponder on a rainy day. At Maine theaters, you’ll find both amateur and professionals putting on shows you won’t forget. 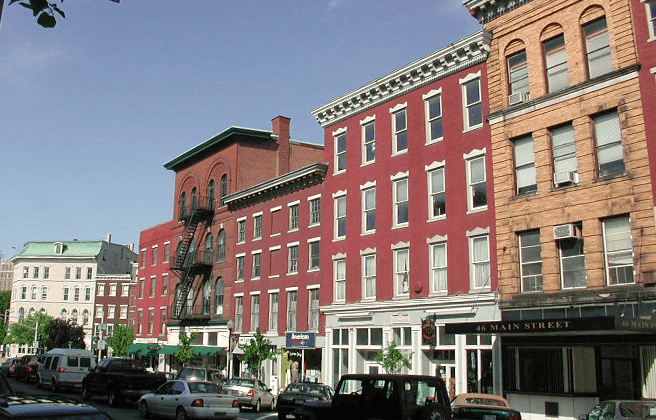 Maine’s historic districts, like Searsport, Bath, Belfast, Gardiner, Skowhegan, and Kennebunk, provide portals into both the state’s architectural and cultural past. Craving some classic Maine lobster? You’ve come to the right place. But if you think the culinary adventure ends there, your taste buds are in for a pleasant surprise. There’s no shortage of food festivals that celebrate Maine staples. Take Eastport’s Salmon and Seafood Festival, the Pemaquid Oyster Festival or the Maine Lobster Festival in Rockland. The state’s craft brewery scene is buzzing, and the Maine Beer Trail puts you on the path to sudsy satisfaction. 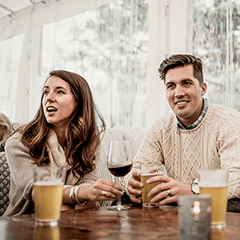 Plus, you're bound to stumble upon a food truck or two while you’re out sipping brews, especially in the foodie haven of Portland. There’s no better way to get to know the towering mountains of Maine than by taking them one step at a time. Going up. Acadia National Park and Maine’s many state parks offer the perfect launch pad for a day of hiking. Tumbledown Mountain and Pleasant Mountain are both great springtime hikes, while Mount Katahdin (Maine’s tallest peak) is best tackled in summer. You’ll find plenty of kid-friendly hikes, too. In Acadia National Park, Wonderland Trail takes you from the woods to the sea and back on a winding (flat) path. For an extra challenge, Acadia National Park contains dozens of rock climbing routes, but you can find plenty more in Camden and Maine’s western mountains, like Shagg Crag. Maine is home to original makers and shakers, and their detailed work is your one-of-a-kind find. From Portland’s boutiques to the Kittery Outlets, shopping in Maine is as unique as the landscape. Maybe you’ll take home a colorful reclaimed lobster trap rope doormat from the Maine Float Rope Company, or—an all-time classic—a pair of L.L.Bean boots. If you’re with a group that has diverse tastes, or you’re not quite sure what you’re looking for, Freeport is the place to be. Home to more than 120 outlets and scores of boutiques and specialty shops, one day might not be enough. From charming main streets to Portland’s buzzing culinary scene, cities in Maine offer surprise after surprise. Whether it’s natural splendor, handmade crafts, or unique cuisine, you’ll find something to do, see and savor in every corner of the state. You’ll find plenty of things to do in Maine’s biggest city. If you fancy yourself a foodie, you’ve come to the right place. Michelin Star restaurants are just as much at home here as the plentiful food trucks. 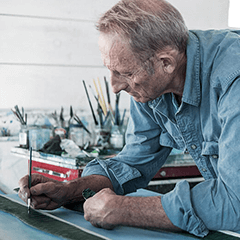 You’ll find the city is a coastal creative hub. Be sure to check out a concert at the State Theater or an exhibition at the Portland Museum of Art. 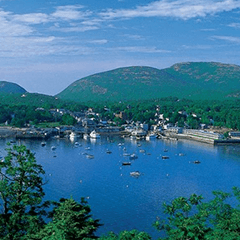 Perched on Mount Desert Island, Bar Harbor offers plenty of opportunities to get outdoors and enjoy some of Maine’s most beautiful landscapes. 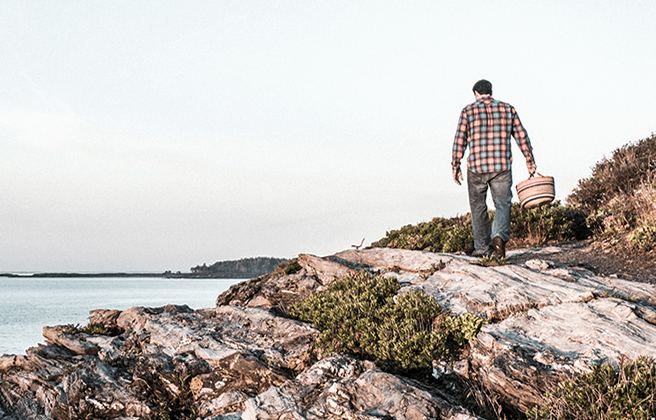 Climb Cadillac Mountain in Acadia National Park, check out the oceanarium, or get a front-row seat at a lumberjack show in nearby Trenton. 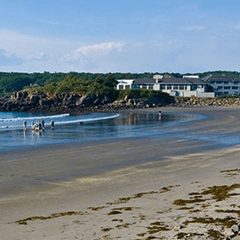 The scenic coastal town of Ogunquit is a laid-back summer hideaway where you can hit the beach, go deep-sea fishing, or head out for some seasonal whale watching. After some sailing or kayaking, head to the boutiques and antique shops for a special find. Spend your time in Kittery exploring antique shops, stopping at charming pubs, and checking out its historic homes. Shoppers will love the Kittery Outlets. 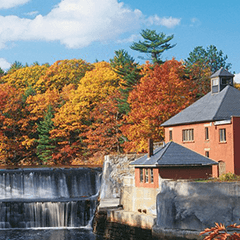 Situated right across the border from New Hampshire, the coastal town is known as the "Gateway to Maine." What’s a giant statue of mythic Paul Bunyan doing towering over Bangor? 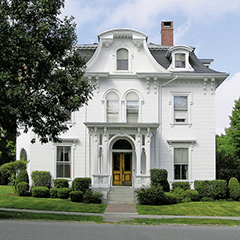 Keeping watch over what was once the “Lumber Capital of the World.” You can thank Bangor’s lumber boom of the early 1800s for the architectural masterpieces you’ll find perusing the mansions of the Broadway Historical District, where novelist Stephen King calls home. Don’t be surprised if you feel like you’re walking through a scene from one of his books. Pack your beach towel. The coastal town of York is framed by beautiful sand beaches perfect for a hot summer day. While you’re in town, view the Nubble Lighthouse. There’s a good chance you’ll recognize its crimson roof and white tower—it’s one of the most photographed lighthouses in the world. Welcome to the state capital of Maine. 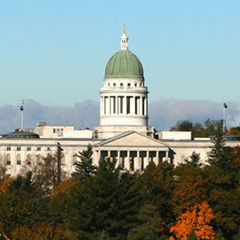 Stop by the State House for a look at the impressive granite architecture and domed tower, and then check out some regional history at the Maine State Museum. Constructed in 1754 and now the oldest original wooden fort in New England, Old Fort Western lets you take a step back in time for a unique glimpse into the state’s rugged history. Come for the shopping. Stay for the uniquely Maine trails. Freeport is home to more than 120 outlets and the L.L.Bean Flagship Store. If it’s hand-crafted, Maine-made goods you’re after, you’ll be sure to find some at the numerous boutiques and small local shops. 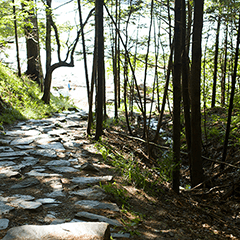 Once you’ve had your shopping fix, head to Wolfe’s Neck Woods State Park for some fresh coastal air on the ocean-side hiking trails. Art lovers will feel right at home in Brunswick where the Bowdoin College Museum of Art—on the National Register of Historic Places—displays its unique collection. 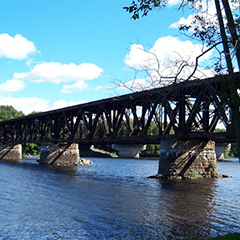 Take a stroll or cruise along the river on the Androscoggin Bicycle and Pedestrian Path. In Belfast, Friday summer evenings are best enjoyed at the Belfast Art Gallery Walk. Peruse more than fifteen galleries, take in the sounds of music on the charming streets, and enjoy farm-fresh cuisine. The towns of Biddeford and Saco are neighbors across the Saco River. Summertime memories are made at Funtown Splashtown USA, a thrilling amusement and water park in one. Soak up the sun at Ferry Beach State Park, or check out the Wood Island Lighthouse. Check out quirky technological history at the Telephone Museum, or take a walk on the grounds of the Woodlawn Museum, Gardens & Park. A canoe trip down the Union River is refreshing on a hot summer day, and the Birdsacre Stanwood Wildlife Sanctuary is peaceful place for birdwatching. 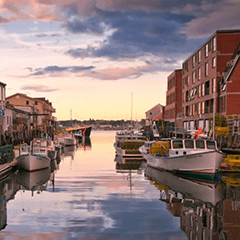 If you’re looking for panoramas of quintessential coastal Maine, this little town should be at the top of your list. 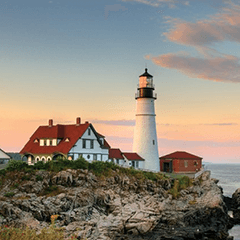 Home to both the Portland Head Lighthouse and Two Lights State Park, you can spend your days walking the dramatic coastline taking in views of the Atlantic and historic towers. 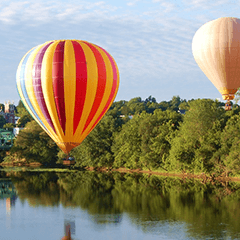 Every August, colorful balloons dot the sky over these towns on the banks of the Androscoggin River. Whether you want to take a balloon ride, or admire the kaleidoscope of floating color from below, the Great Falls Balloon Festival is a can’t-miss. Gritty McDuff’s Brewpub is a popular place in Auburn where you can launch a canoe or kayak at the base of Great Falls and the old mills along the river. In January, check out the Auburn Winter Festival. 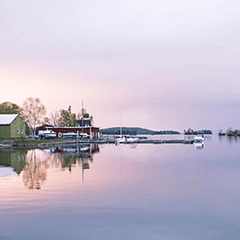 Situated on the southern shore of Maine’s largest lake, Greenville makes the perfect home base for days filled with fishing, boating and hiking. 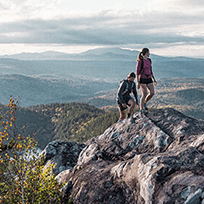 For a birds-eye view of Moosehead Lake, make your way to Mount Kineo and climb to the summit where you’ll be rewarded with panoramic views from its nearly 800-foot cliff. It’s all about getting on the water in Naples. 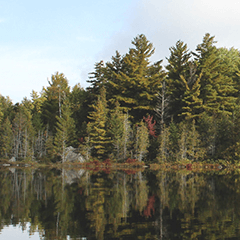 Long Lake and Brandy Pond beg to be explored, and you can easily rent kayaks or jet skis right in town. If you’re not on the water, why not get over it? Experience the thrill of a seaplane ride for an aerial view of the majestic landscape. 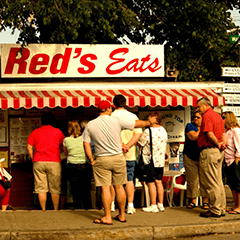 Once you’ve worked up an appetite exploring the town’s charming streets and the Castle Tucker Federal-style mansion, you’ll be ready for a lobster roll from Red’s Eats. Don’t worry if there’s a line. They’re just that good. Then head to the Maine Crafter's Marketplace at the Maine Heritage Village to look for something unique to take home. Summer waves give way to fall colors, and winter runs turn into spring trails. In Maine, each season offers its own unique wonders. Maine’s long summer days create lifelong memories. 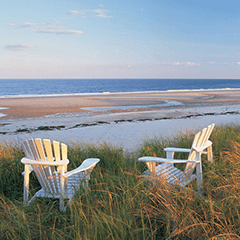 Whether you kick back on one of Maine’s many beaches in July, give surfing a go (yep, surfing is pretty big here), or head out for a sail, the coast is the place to start enjoying the warmer weather. If you’re looking for the quintessential summer camp experience for the kids, look no further. Lover of the links? Maine’s a golf paradise, and we highly recommend starting with the Belgrade Lakes Golf Club. Be sure to pack your hiking boots. From camping to kayaking to mountain climbing, Acadia National Park and Maine’s state parks offer endless outdoor adventure. Surrounded by such beautiful landscapes, it’s no wonder summer weddings are so popular. Nothing compares to Fall in Maine. In October, the coasts and mountainsides are illuminated with the blazing yellows, reds and oranges of autumn foliage. Some of the best leaf-peeping can be found from atop a lighthouse or along a scenic byway. Fall is an excellent time for hiking as the days are cooler and the views are beautiful from atop a scenic overlook. In the crisp air and quiet woods, sportsmen will find the stage is set for an unforgettable hunting or fishing experience, while Maine’s legendary guides will be ready to showcase the state’s natural beauty. When temperatures drops and the snow falls, there’s nothing wrong with hunkering down next to the fire with a good book and some hot chocolate—especially at a cozy Maine B&B. But that’s only half the fun during winter in Maine. 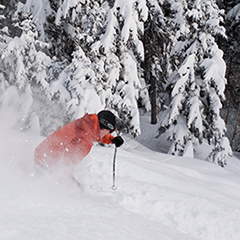 Winter offers its own endless adventures like skiing and snowboarding in the Maine mountains, snowshoeing, cross-country skiing, snowmobiling and ice fishing. After a day spent trekking through the woods or carving some black diamonds, Maine’s spas will have you rejuvenated and ready to go for the next day. Springtime is the right time to start thinking about getting back on the water, and there’s no better introduction than a little whitewater rafting. On the coasts, lobster boats and windjammers are getting ready to head out again, while whale watching is just beginning. Springtime is also great for fishing and there are plenty of Maine Guides who can take you out. If you’re looking for something more relaxed, try a garden tour at Coastal Maine Botanical Garden (in Boothbay Harbor) and Thuya Garden (near Bar Harbor) or just take a stroll along a beach!